When you’re busy worrying about getting several things done and measuring something important, it’s easy to forget or misread the measurement. Well this measuring tape offers a solution for those days that you can’t seem to remember the measurement long enough to grab a piece of paper and write it down. Although it does seem to look a little cheesy, taking design cues from the iPod is an odd choice for a home improvement gadget. However, it’s still a handy tool to have around. It offers 16 feet of measuring tape and of course has the normal perks of measuring tape. It can stop and hold the tape at one spot if you need it to. 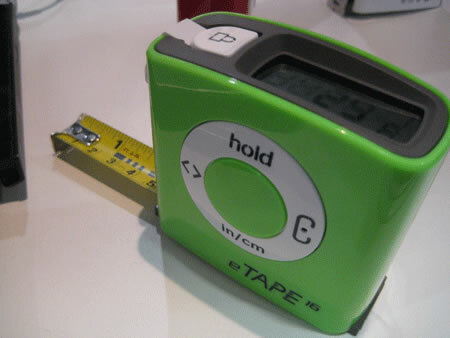 It also has an LED screen, which is what really makes the device stand out from your average measuring tape. The LED screen will display the measurement, then it has an internal memory that will keep limited records of measurements. It was designed by the Taiwan San Tyau company, who will hopefully make their eTape available soon. Update: I just happened to notice that Think Geek has already managed to get these, they are estimating that you’ll be able to get yours as of the first of February. It’ll cost you $24.99.